Like many eighteenth-century recipes, Benjamin Franklin’s instructions for making apple pudding don’t offer a lot of detail, just enough to inspire certainty that the end result would be inedible by twentieth-century standards. What better reason could there be to break out the mixing bowl! The sense of the unfamiliar has always been what compels me about history. I like that truism, “the past is a foreign country.” It’s a message that I often repeat to my students, who tend to make sense of the past by seeking points of similarity with their own lives. When you’re reading a primary source and something confuses you, that’s a good sign. You’re onto something, you’re not just finding what you brought to the source yourself. I, for example, do not bring a love of boiling to my reading of dessert recipes. Baking I expect – hours of boiling, not so much. But eighteenth-century cooks, on the other hand, were all about the boiling. Home cooks in eighteenth-century America cooked over open hearths with swinging metal cranes that could suspend pots over the flames. More sophisticated homes might have bee-hive ovens set into the fireplace, or dutch ovens to set within the embers, but a great deal of home cooking until the mid-nineteenth century took place in hanging pots that bubbled away. The thing that especially confuses me about so many old recipes is just how much boiling they call for, hours and hours of boiling. Today we boil very little, and what we do boil we tend to boil briefly. I boil pasta for anywhere from 7 to 12 minutes depending on the type, and I’m always anxious to drain the pot while the noodles are still al dente. Sometimes I boil green beans, but just for a few minutes to preserve their colour and bite (and often I steam them instead). I boil eggs, but I like the yolks soft so I don’t leave them in for more than 7 minutes. And never do I boil desserts, certainly not for hours at a time. 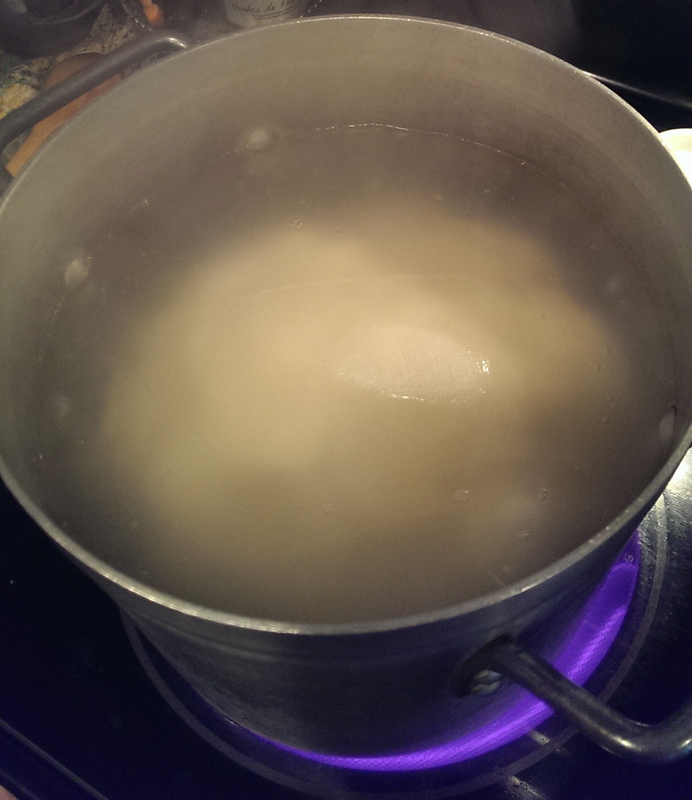 The next direction was to add cold water until a stiff dough formed. Having spent the past twenty-five years of baking trying to add as little water to my pie dough as possible to prevent it turning tough, I needed to tamp down all my better instincts to pour in the cup and a half of cold water that my dry mix required to come together. 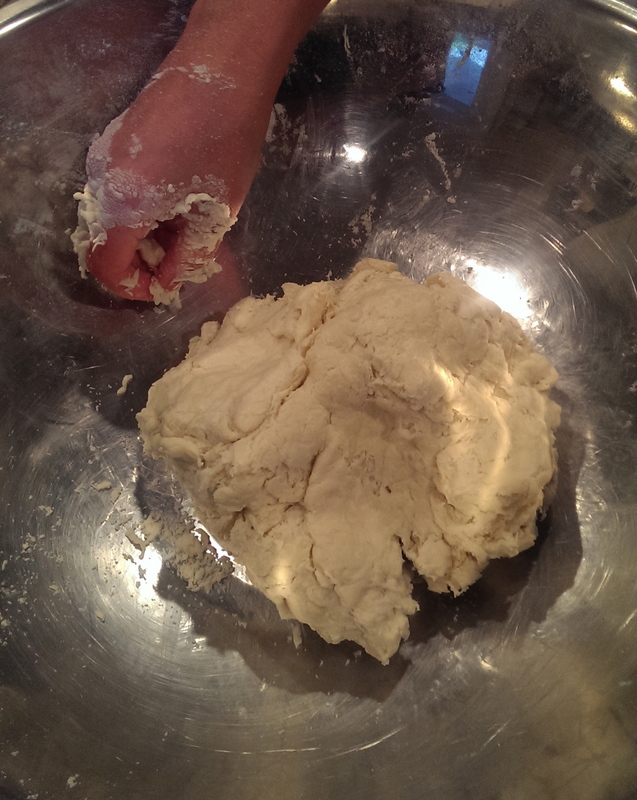 Afterwards, I needed a stronger pair of arms than my own to beat the brick of dough into submission. Good thing le rosbif was on hand for the next direction. 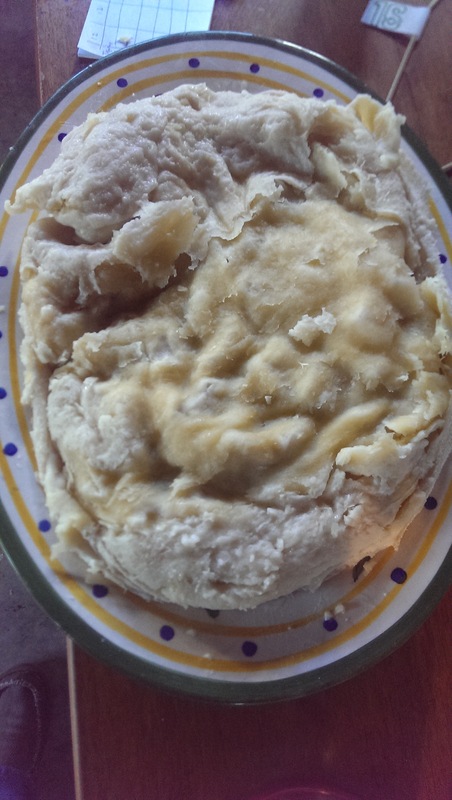 Like all puff pastes, the dough had to be rolled out, buttered, rolled up, rolled out, and buttered again, nine to ten successive times until another half pound of butter or more was added to the paste. 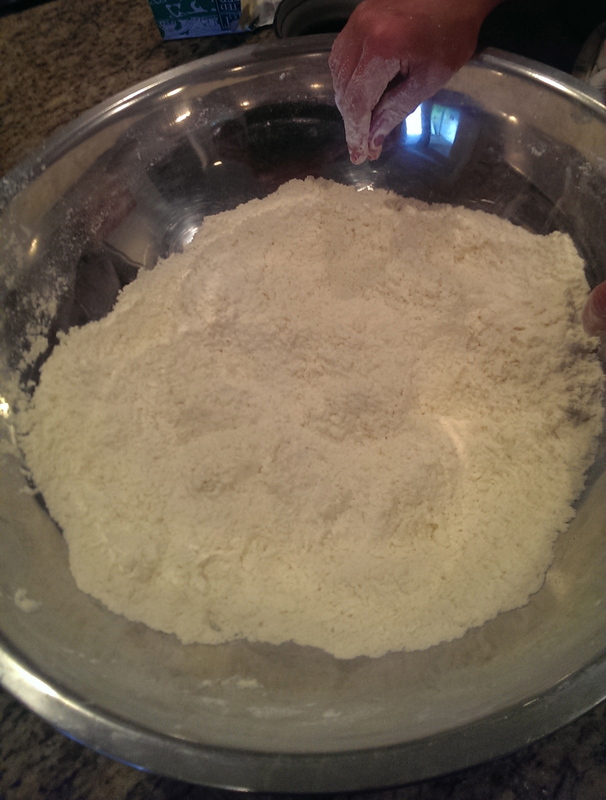 (Altogether we used a pound of butter for our two pounds of flour.) Maya was also on hand to help with the buttering. 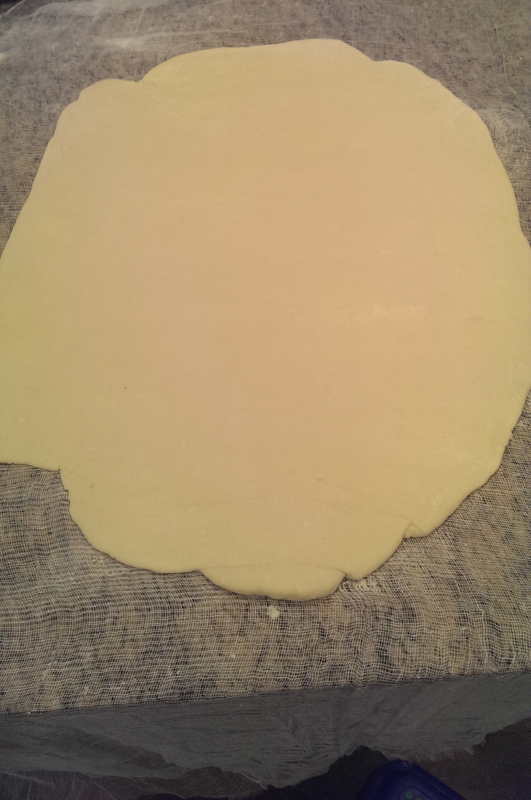 After an hour of buttering and rolling, we were left with a lovely, pliable, yellow dough. 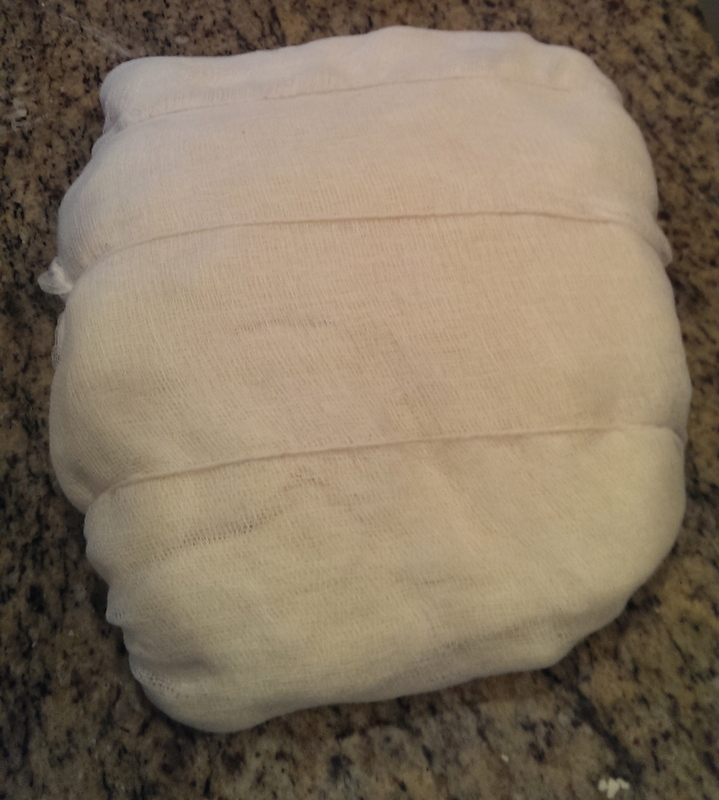 We rolled it out “half a thumb’s thickness” and set the dough on a cheese cloth. 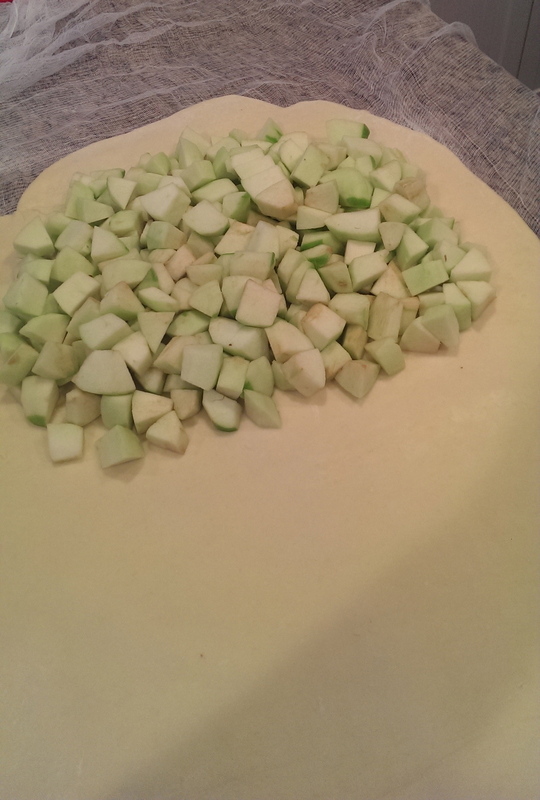 Franklin’s recipe calls next for chopped cored apples to be placed upon the dough. No seasoning is done at this stage: no spices added to the apples, no sugar, no butter, no lemon. Just apples. How big? How many? Over how much of the dough? The recipe held no answers. Nor did the recipe explain how to seal the dough. 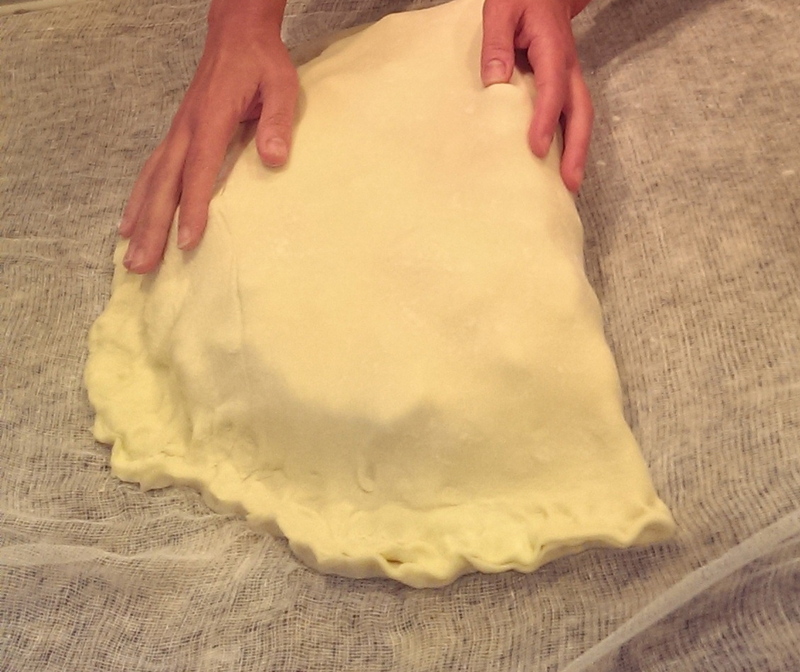 We went for crimping and ended up with something that looked like a giant Cornish pasty. At least until we wrapped it up in pastry and began the boiling, whence it commenced to look a lot more like a brain. It was hard to commit willful destruction of this beautiful pasty, rather than pop the parcel into a hot oven where it might grow golden and crisp. What was the purpose of building up 10 layers of lamination only to melt out all the butter in a bubbling pot? The cooking instructions said to boil the pudding between 2 to 4 hours depending on whether it be small or great. Unsure of the standard of measurement, I decided on 3 hours. There were no further cooking directions and perhaps I should have just left it be, but worried that the pudding wasn’t getting cooked on the top, which bounced above the bubbling water, I flipped the package each hour. Perhaps if I hadn’t, the pudding would have developed more of a crust on its top surface. For the final step, Franklin directs that the top of the pudding be removed, sugar and butter be mixed in with the apples, then the top replaced and the whole mess served immediately. 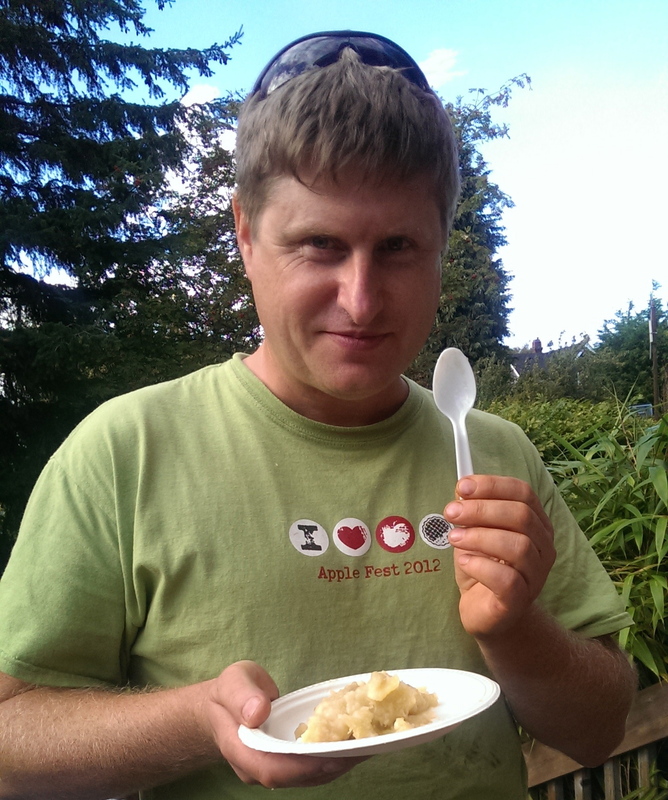 We were now running an hour late for apple fest (and poor le rosbif had been so busy with the preparation of my pudding that he had no time to prepare his own pie). Off we rushed, pudding on plate, to the party. 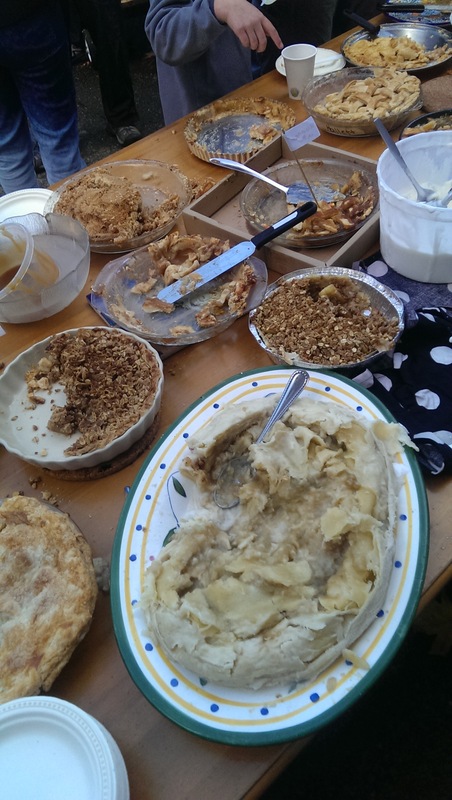 The judging of the pies had already commenced. I burst my way into the secret chamber (the hosts’ garage) and set our steaming pudding upon the judging table, cutting away at the muslin with great rapidity. Lifting up the soggy dough from one side I found that the apples had reduced to a beautiful sauce within the boiled puff casing. I dumped in some chopped butter and brown sugar, then closed the pudding back up and left the judges with a spoon and some simple instructions. You may all be shocked to read that the pudding above did not win first place in the pie contest, in fact it did not even win honourable mention. Mostly it earned confused looks and faint attempts at praise. I am not sure that anyone quite believed me that I had cooked the pudding in the spirit of historical inquiry rather than with the intention to produce an edible dessert. After the judging, as the guests lined up to serve themselves from all the entries, only the brave-hearted few went for the pudding. Our friend Matthias pronounced it delicious. But he grew up in East Germany, where they probably boiled all their desserts anyhow. Perhaps the most fascinating reaction came from an older British woman who took one look at the pudding and said, “my mother used to cook that all the time.” Really, I asked? Up until then I had no idea if what we had produced resembled in any way the dessert that Franklin intended. Where did her mother get the recipe, I asked. From Mrs. Beeton, she answered – the mid-19th century English cookery author whose apple puddings, no doubt, looked a lot like those of her forebear a century prior, Hannah Glasse. In short, I think we can judge this experiment to have been a success! And for what it’s worth, I can report that the mess did taste quite nice in a bland, comforting, soft, sort of way. If I had it to do over, I might cook the pudding in a mould (the recommendation of the woman who’d grown up eating this dish), and I wouldn’t flip the pudding, but leave it to develop a harder skin on top. When we returned home, I dumped the leftovers in a baking dish and sprinkled sugar on the top and popped it in the oven to brown up. Not bad at all on a damp fall day like today. Delicious as it must have been, I shall not try it. I’ll just take your word. I enjoyed the blog enormously. Are you going to post any more of Franklin’s recipes, I hope? Brilliantly funny. Loving Mathias too. I don’t know how you managed to control the nutmeg/cinnamon/anything shake to make it better, but well done! I love that you ended up baking it after all. I think I would have done the same! It is odd to do a puff pastry for a boiled pudding. I wonder if it could have been a mistake by old Ben? 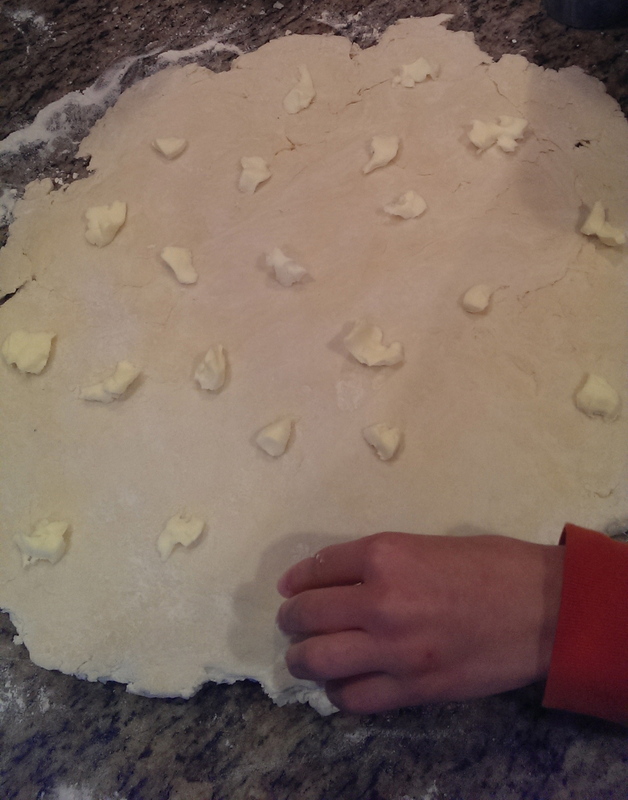 Perhaps someone said a “make a butter pastry” and then he erroneously wrote in the recipe for a puff pastry. Presumably, Mr. Franklin did not himself make this pudding, having a cook to take care of those details. So he would not have been a good enough cook to notice his own mistake. I also think that adding whatever spices you would like would be well in keeping with the times. In its most basic version, no spices would be added, especially because they would have been so costly. But in a more well to do household, a cook would naturally add whatever she had to make the dish better. good theories – although I think the direction to use puff pastry for the pudding originates in Hannah Glasse, so not just an expression of Franklin’s lack of cooking knowledge. I do get a perverse pleasure out of following these recipes exactly, but next time – if there is a next time – I will apply common sense and spice/cook to my own sensibilities. It does take strength not to meddle while one is cooking! I do hope you will blog the results, if you should try it again!